With the recent coloring craze, it's no wonder that soothing and relaxing hobbies for adults are becoming more popular. In today's fast-paced world, it's good to have an activity where you can clear your mind and concentrate on creating something beautiful. 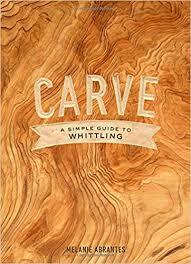 In the new book Carve, Melanie Abrantes, a woodworker by trade, gives everyone the tools, directions and encouragement to pick up the hobby of whittling. This small book is packed with useful information. It begins with two lists of tools, one necessary to get started, and another of tools you may want to obtain when you become more comfortable with whittling. A list of safety information for working with sharp objects is also useful, including establishing the somewhat scarily named "blood circle" of at least an arm's length away from other people before working with tools. Dull tools are more likely to cause mishaps, so a section is included on how to correctly sharpen your knife. This is followed by the basic techniques the whittler will use, including the "push cut" and the "stop cut" (each illustrated with a photo). Advice is also provided on how to choose and cut your wood to the proper size before beginning your project. The remainder of the book is divided into projects in the following categories: Eat, Live, and Camp. Each project is graded according to difficulty, and shows a photo of what the finished object should look like. There is also a list of tools needed for the project, followed by step by step instructions and photos of the various steps being performed. The book ends with a section on how to make your piece more personal using such techniques as staining or burning. Templates for the included projects are located at the end of the book. I have never attempted to whittle, but after reading this book, I may have a go! I'm sure it's not as easy as the reassuring author would have you believe to create the projects in the book. Still, the things that you can create using this book, including a comb, a soap dish and even eating utensils, are all very attractive and appealing. Every aspect of whittling is covered, even some that would never have occurred to me, so this book is definitely a good place for aspiring woodworkers to learn all they need to know about his appealing hobby.